Have you used CRM Software before? Oracle is a company that’s well known in the world of enterprise support. It’s famous for products that power large scale businesses including database software, the Solaris operating system, and, of course, the programming language Java. Amid all those enterprise products the company also offers a customer relationship management (CRM) platform. While not the first name that comes to mind — that honor belongs to Salesforce — Oracle is still a big name when you’re looking for a CRM. Salesforce, meanwhile, is the market leader with numerous companies singing its praises including Adidas, Amazon Web Services, Toyota, and Spotify. But while Salesforce works for those successful companies the real question is whether Salesforce or Oracle can work for your business. This article aims to guide you through that decision with a general comparison of both platforms. What Is Oracle Sales Cloud? Salesforce or Oracle - Which CRM Is Best? Oddly, both Salesforce and Oracle chose the same name for their core CRM product: Sales Cloud. To avoid any misunderstandings we’ll just refer to them as Oracle and Salesforce. There are many complementary services on both sides such as platforms for one-to-one marketing, customer service, all the way up to Enterprise Resource Planning (ERP), but we’ll focus here on the two Sales Cloud products. 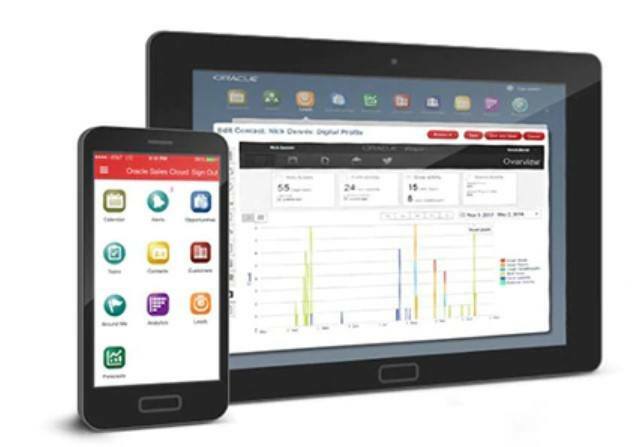 Oracle’s version has all the essential data records of a CRM: activities, leads, opportunities, contacts, accounts, as well as analytics and forecasts. It also has a dashboard for each member of the sales team that shows the top open deals, a summary of current top leads, a graph of the current sales pipeline, and the next 10 activities (tasks) that person needs to do. Oracle allows for customization of this section for companies that need more or less information on their dashboard. 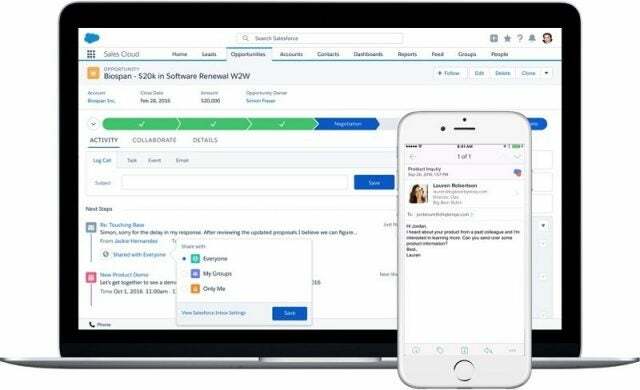 Salesforce offers a similar dashboard on its Home tab in the new Lightning interface (as opposed to Salesforce Classic) that by default shows quarterly performance, open tasks, upcoming calendar events, recent opportunities, and suggestions from Salesforce’s intelligent, automated assistant. Again, the dashboard can be customized for each businesses needs. Drilling deeper both services make it easy to manage converting leads into opportunities and have that data reflected on reports, dashboards, and summaries. Both have built-in calendars to track key appointments and meetings, as well as social networking-style internal company feeds where sales team members can post information to share with each other. One nice feature that Oracle has built-in is Lightbox. This feature allows sales team members to access shared presentation files and download them on demand. Salesforce doesn’t offer a feature like this by default, but its vibrant application market, AppExchange, may have some options that would work. Taking a look at the two interfaces it’s clear that Salesforce has the more modern look with its Lightning interface. Oracle’s look is capable enough but it relies heavily on icons and switching screens. Salesforce also isn’t quite as busy as Oracle’s compact and icon-based interface. Oracle Sales Cloud is the company’s basic CRM with all the essential features you need to support a sales team. It actually comes in two versions: Oracle CX Sales Cloud and Oracle CRM On Demand Sales. We’re talking about Oracle CX in this article. One glance at the interface shows that it is very much an enterprise product, with perhaps some appeal to mid-sized businesses. Beyond sales, for example, Sales Cloud can support all kinds of information and incentives for large sales teams such as estimated compensation details, performance metrics, and personal information. Oracle Sales Cloud is also one part of a much larger whole, similar to Salesforce. Beyond Oracle Sales Cloud, the company has tools for one-to-one marketing, social marketing, customer service, personalized online commerce, and price quote software. Now that we have a basic idea of what Oracle and Salesforce are like let’s look at the upsides and downsides. First, if you want to get up and running right away then Salesforce is probably the better choice. Oracle uses a traditional enterprise-type infrastructure just to sign-up where you have to work through an Oracle representative to get started. With Salesforce you can just sign up and get going that same day with products aimed at startups and small businesses. Both Salesforce and Oracle do require at least some in-house administrator support to help new employees get acquainted with the software, and to customize the platforms for your company’s needs. There are ways around this, of course, but ideally someone in your organization would be able to take care of any needs that crop up on either platform. What you won’t find with either service is a particular simplicity that you would get with Hubspot or Zoho CRM, two products that are usually better suited to smaller, more nimble teams that don’t have time for long training sessions. That’s not to say that these bigger platforms are impossible to navigate, on the contrary. They are, however, absolutely loaded with powerful tools. You really need a good amount of familiarity with these platforms to take advantage of them and get your money’s worth. Salesforce or Oracle – Which CRM Is Best? Both platforms are chock full with powerful tools, and it really comes down to which service would best suit your team, and its needs. Overall, a company looking to get up and moving quickly should go with Salesforce and its self-service sign-ups. If your company is already using some Oracle products, however, it may make more sense to go with Oracle’s version of Sales Cloud. In many ways these two services have very similar capabilities, but the differences in price are quite significant. To use Oracle CX Sales Cloud for midsize businesses, you’re looking at $100 per user, per month minimum. Salesforce pricing can get that high as well, but there are lower tier prices that start at $25 per user, per month for teams of less than 5, or $75 per user, per month for the Lighting Professional tier. If you need Salesforce’s more advanced features and customizability you’d need to move up to the Enterprise pricing tier where Salesforce begins to match or exceed Oracle’s pricing. Both Oracle and Salesforce offer powerful services, but the best way to find a CRM that’s right for you is to get a customized quote. Click the Get Quote button above to receive proposals from a variety of CRM providers that take into account your company’s specific needs. By clicking to compare, you’ll receive quotes from various suppliers, tailored to the needs of your business. If you enter into a contract with a provider, we may receive a payment for the introduction. This helps Tech.co to provide free advice and reviews. It carries no additional cost to you, and doesn’t affect our editorial independence. Black Friday 2018 is upon us, and that means some fantastic discounts on all sorts of tech products. We round up the best Black Friday 2018 tech deals, from TVs and tablets to laptops, phones and software. Plus, we have handy advice on how to spot the best deals and prices. Apple's reported subscription news service before its even got going. Publishers are, apparently, not keen on the terms of the deal that Apple is proposing — which involves the company taking as much as 50% of all the subscription revenue generated. New leaks might have revealed the design and some of the internals of the iPad Mini 5. Released by a Chinese Twitter user seemingly with access to Apple prototypes and pre-production models, the new iPad Mini 5 images reveal another case of evolutionary design changes for Apple. Ian is an independent writer based in Israel who has worked as a technology industry reporter and critic for more than ten years. He’s written for PCWorld, Macworld, TechHive, Yahoo, Lifewire, and The Huffington Post. He primarily covers Windows, PC and gaming hardware, video and music streaming services, security software, and browsers.